Baby booms seem to come in waves. First everyone you know is having babies, then there’s a lull. I’ve been pleased to find that in the latest round of babies being born, there are lots of organic and natural baby presents from which to choose. Weddingish.com a favorite of celebrities like Paula Abdul and Eva Longoria has been offering fashionable tees and tanks for brides-to-be since 2005. Branching out into the green sphere with all organic tees proclaiming “Bride” or Maid of honor” has only increased their popularity. Now they offer gear for baby too! 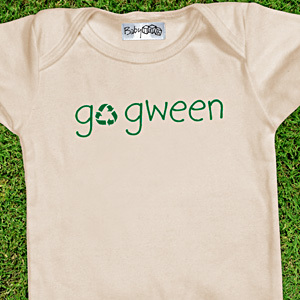 Made from 100% organic cotton, the “Go Gween” baby onsie features the recycle symbol and is priced at $24.00. The matching baby hat goes for $12.00. Now that the green movement has gained enough momentum to be considered somewhat mainstream, we’re getting some fun ways to get across a serious message. This is one of them! You can also find some cute organic clothes at http://www.sweetiepiebaby.com. I recently received a gift certificate and a gift basket with some of their stuff and it was really nice!!! Organic cotton is soo soft compared to conventional cotton. The Best Vegan Dal Soup Recipe Ever!